A kitchen utensil is a hand-held, typically small tool that is designed for food-related functions. Food preparation utensils are a specific type of kitchen utensil, designed for use in the preparation of food. Some utensils are both food preparation utensils and eating utensils; for instance some implements of cutlery – especially knives – can be used for both food preparation in a kitchen and as eating utensils when dining. In the Western world, utensil invention accelerated in the 19th and 20th centuries. It was fuelled in part by the emergence of technologies such as the kitchen stove and refrigerator, but also by a desire to save time in the kitchen, in response to the demands of modern lifestyles. 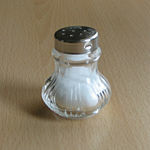 Used during cooking to cover meat in its own juices or with a sauce. An implement resembling a simple pipette, consisting of a tube to hold the liquid, and a rubber top which makes use of a partial vacuum to control the liquid's intake and release. The process of drizzling the liquid over meat is called basting – when a pastry brush is used in place of a baster, it is known as a basting brush. A deep, wide-bellied, short-necked vessel used to cook bean-based dishes Beanpots are typically made of ceramic, though pots made of other materials, like cast iron, can also be found. The relatively narrow mouth of the beanpot minimizes evaporation and heat loss, while the deep, wide, thick-walled body of the pot facilitates long, slow cooking times. They are typically glazed both inside and out, and so cannot be used for clay pot cooking. Biscuit mould, Cookie cutter, Cookie mould Shaping biscuit dough Generally made of metal or plastic, with fairly sharp edges to cut through dough. 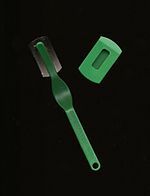 Some biscuit cutters simply cut through dough that has been rolled flat, others also imprint or mould the dough's surface. Cookie press A device for making pressed cookies such as spritzgebäck. It consists of a cylinder with a plunger on one end which is used to extrude cookie dough through a small hole at the other end. Typically the cookie press has interchangeable perforated plates with holes in different shapes, such as a star shape or a narrow slit to extrude the dough in ribbons. Blowtorch, blowlamp Commonly used to create a hard layer of caramelized sugar in a crème brûlée. Milk watcher, Milk guard, Pot minder Preventing liquids from boiling over outside of the pot A disc with a raised rim, designed to ensure an even distribution of temperature throughout the pot. This preventing bubbles from forming in liquids such as milk, or water which contains starch (for instance if used to cook pasta). Can be made of metal, glass or ceramic materials. To hold food, including food that is ready to be served A round, open topped container, capable of holding liquid. Materials used to make bowls vary considerably, and include wood, glass and ceramic materials. To cut bread A serrated blade made of metal, and long enough to slice across a large loaf of bread. Using a sawing motion, instead of pushing force as with most knives, it is possible to slice the loaf without squashing it. Browning plate, Browning bowl Used in a microwave oven to help turn food brown Generally made of glass or porcelain to absorb heat, which helps colour the layer of food in contact with its surface. Used to produce decorative butter shapes. Cake shovel, pie cutter To cut slices in pies or cakes, and then transfer to a plate or container This utensil typically features a thin edge to assist with slicing, and a large face, to hold the slice whilst transferring to a plate, bowl or other container. Designed to cut soft, sticky cheeses (moist and oily). The cutting edge of cheese cutters are typically a fine gauge stainless steel or aluminium wire. Used to cut semi-hard and hard cheeses. It produces thin, even slices. To assist in the formation of cheese A gauzed cotton cloth, used to remove whey from cheese curds, and to help hold the curds together as the cheese is formed. Originally used to slice large cuts of beef, it is now the general utility knife for most Western cooks. Olive stoner Used for the removal of pits (stones) from cherries or olives. Hacking through bone or slicing large vegetables (such as squash). The knife's broad side can also be used for crushing in food preparation (such as garlic). A large broad bladed knife. 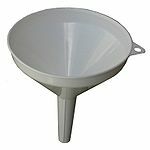 Used for draining substances cooked in water A bowl-shaped container with holes, typically made from plastic or metal. It differs from a sieve due to its larger holes, allowing larger pieces of food, such as pasta, to be drained quickly. 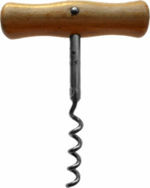 Pierces and removes a cork from a bottle. Lobster cracker Used to crack the shell of a crab or lobster A clamping device, similar in design to a nutcracker but larger, with ridges on the inside to grip the shell. A portable board on which food can be cut. Usually smaller and lighter than butcher's blocks, generally made from wood or plastic. 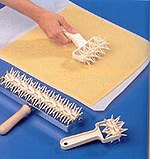 Bench scraper, Scraper, Bench knife To shape or cut dough, and remove dough from a worksurface Most dough scrapers consist of handle wide enough to be held in one or two hands, and an equally wide, flat, steel face. Pierces the air pocket of an eggshell with a small needle to keep the shell from cracking during hard-boiling. If both ends of the shell are pierced, the egg can be blown out while preserving the shell (for crafts). Holds a raw egg, and is placed inside a pot of boiling water to poach an egg. A slotted spoon-like utensil used to separate the yolk of an egg from the egg white. Slicing peeled, hard-boiled eggs quickly and evenly. Consists of a slotted dish for holding the egg and a hinged plate of wires or blades that can be closed to slice. Used to correctly time the process of boiling eggs. Historical designs range considerably, from hourglasses, to mechanical or electronic timers, to electronic devices which sense the water temperature and calculate the boiling rate. Device used to defat or separate fat from stocks or gravies. A long, narrow knife with a finely serrated blade, used to slice fine filet cuts of fish or other meat. Blends flour with other ingredients and aerates it in the process. Used to mash or sieve soft foods. Typically consists of a bowl, a plate with holes like a colander, and a crank with a bent metal blade which crushes the food and forces it through the holes. Used to channel liquid or fine-grained substances into containers with a small opening. A pipe with a wide, conical mouth and a narrow stem. Presses garlic cloves to create a puree, functioning like a specialized ricer. Finely serrated knife for separating segments of grapefruit or other citrus fruit. Gravy separator A small pouring jug that separates roast meat drippings from melted fat, for making gravy. Chops or minces raw herbs. A ladle is a type of serving spoon used for soup, stew, or other foods. Used to slash the tops of bread loaves in artisan baking. A juicer with a fluted peak at the end of a short handle, where a half a lemon is pressed to release the juice. 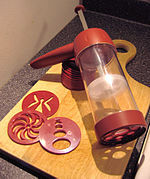 A juicer, similar in function to a lemon reamer, with an attached bowl. Operated by pressing the fruit against a fluted peak to release the juice into the bowl. Lobster fork A long-handled, narrow pick, used to pull meat out of narrow legs and other parts of a lobster or crab. Measuring jug, Measuring jar The Pyrex-brand traditional measuring cup (the Anchor Hocking-brand look-alike is shown, right) is available in 1 cup (8 ounce), 2 cup (16 ounce), 4 cup (32 ounce) and 8 cup (64 ounce) sizes and includes U.S. customary units in quarter, third, half and two-thirds cup increments, as well as metric units. Typically sold in a set that measures dry or wet ingredients in amounts from 1/4 teaspoon (1.25 ml) up to 1 tablespoon (15 ml). 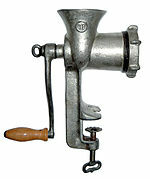 Mincer Operated with a hand-crank, this presses meat through a chopping or pureeing attachment. Used to tenderize meats in preparation for cooking. Usually shaped like a mallet. 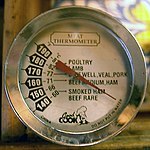 Thermometer used to measure the internal temperature of meats and other cooked foods. 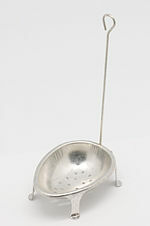 Small scoop used to make smooth balls of melon or other fruit, or potatoes. To finely and consistently chop/mince foods, especially herbs. To zest citrus fruits or finely grate hard foods such as cheese. To make foam or froth in milk for coffee. Essentially a small battery powered electric mixer. Molcajete To crush food, releasing flavours and aromas Generally made from either porcelain or wood, the mortar is shaped as a bowl. The pestle, generally shaped like a small club, is used to forcefully squeeze ingredients such as herbs against the mortar. To crack open the hard outer shell of various nuts. A small, specialized grating blade for nutmeg. Oven mitt To protect hands from burning when handling hot pots or trays. 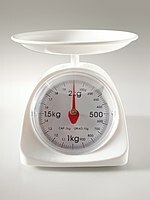 To evenly dispense soft substances (doughs, icings, fillings, etc.). Cuts into pastry ingredients, such as flour and butter, for blending and mixing while they are in a bowl. It is made of wires curved into a crescent shape and held by a rigid handle. Basting brush To spread oil, juices, sauce or glaze on food. Some brushes have wooden handles and natural or plastic bristles, whilst others have metal or plastic handles and silicone bristles. Cuts straight or crimped lines through dough for pastry or pasta. Ricer Presses very smooth vegetable mashes or purees, operates similar to a meat grinder/mincer. Used for dejointing and cutting uncooked poultry; reinforced with a spring, they have one serrated blade and pointed tips. Used to pierce bread dough, cracker dough, pizza dough or pastry dough to prevent over rising or blistering. A long, rounded wooden or marble tool rolled across dough to flatten it. Drum sieve Used as a strainer, grater, or food mill. A tamis has a cylindrical edge, made of metal or wood, that supports a disc of fine metal, nylon, or horsehair mesh. Ingredients are pushed through the mesh. Can opener To open tins or cans Designs vary considerably; the earliest tin openers were knives, adapted to open a tin as easily as possible. Used to slice through tomatoes. A small serrated knife. For gripping and lifting. Usually used to move items on hot surfaces, such as barbecues, or to select small or grouped items, such as sugar cubes or salad portions. Two long arms with a pivot near the handle. Butcher's twine, Cooking twine, Kitchen string, Kitchen twine For trussing roasts of meat or poultry. Twine must be cotton—never synthetic—and must be natural—never bleached—in order to be "food grade". 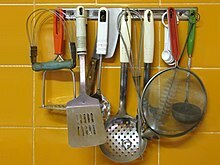 Balloon whisk, gravy whisk, flat whisk, flat coil whisk, bell whisk, and other types. To blend ingredients smooth, or to incorporate air into a mixture, in a process known as whisking or whipping Most whisks consist of a long, narrow handle with a series of wire loops joined at the end. Whisks are also made from bamboo. For mixing and stirring during cooking and baking. For obtaining zest from lemons and other citrus fruit. A handle and a curved metal end, the top of which is perforated with a row of round holes with sharpened rims . ^ "Kitchen technology". Cornell University Library. Retrieved 22 August 2012. ^ a b c d e Conran, Caroline; Conran, Terence & Hopkinson, Simon (1997). The Conran Cookbook. Conran Octopus Ltd. p. 229. ISBN 1840911824. 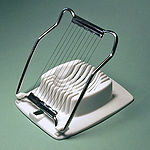 ^ "Egg slicer," in Charles G. Sinclair, ed., The International Dictionary of Food and Cooking, p. 184. Peter Collin Pub., 1998. Google Book Search. Retrieved 18 August 2012. ^ a b Conran, Caroline; Conran, Terence & Hopkinson, Simon (1997). The Conran Cookbook. Conran Octopus Ltd. p. 237. ISBN 1840911824. ^ a b c Cunningham, Marion (2008). The Fannie Farmer Cookbook. Alfred A. Knopf. p. 27. ISBN 0679450815. ^ Conran, Caroline; Conran, Terence & Hopkinson, Simon (1997). The Conran Cookbook. Conran Octopus Ltd. p. 233. ISBN 1840911824. ^ Roots, Levi (14 November 2009). 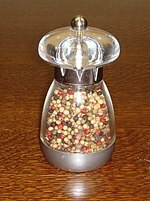 "Best kitchen gadget: pestle and mortar". The Independent. Retrieved 5 October 2012. ^ Cunningham, Marion (2008). The Fannie Farmer Cookbook. Alfred A. Knopf. p. 30. ISBN 0679450815.